Hurricane Matthew wreaked havoc on Cumberland County in October 2016. 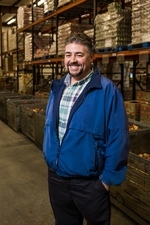 While the damage was significant so was the outpouring of local support like local volunteer Corey Brown who jumped right in to help and to lead at Second Harvest. Below is a question and answer with Brown about the importance of volunteering. A: Since first grade, so that’s 31 years. Q: Where do you volunteer? 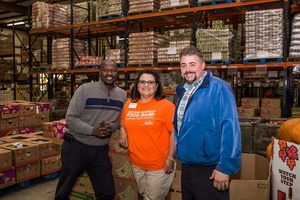 Food Bank of Southeast North Carolina. load groceries. I’ll buy people food. Q: Where did you learn to be so giving? gained by just helping people. ever remember doing for someone? task of 15 things that needed to be done. I worked 7 a.m. to 1 p.m.
who come in. And I like meeting people. handed out. We went through the cooler. We stocked and moved food to the front. Everybody wants to do something here. know about you right away? for the limelight at all. really sad to see people lose everything. there hadn’t been a natural disaster. 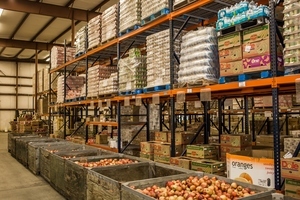 If you are interested in volunteering at Second Harvest Food Bank for Volunteer Saturdays, applications are onlineat hungercantwait.org, or you can send an email to julia.morales@actionpathways.ngo or call (910) 485-6923.
member agencies and local, state, and national partners. The Food Bank’s primary service area includes Bladen, Cumberland, Duplin, Harnett, Hoke, Robeson, and Sampsoncounties. The food bank provides nutritious food to those at risk of hunger through anetwork of over 250 non-profit members. FACT: It would take more than $850 million to meet food needs in our service area. FACT: More than 20% of individuals in our service area are critically food insecure. their ability to grow and learn appropriately.